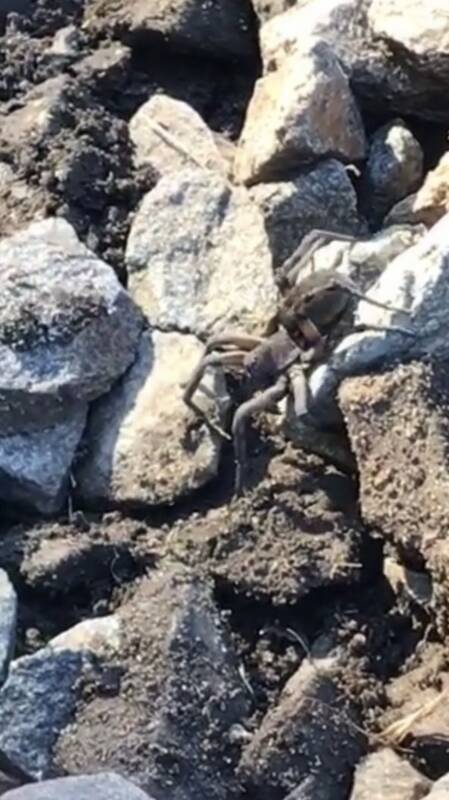 Came across this walking along a bed of rock in a job site I was working in Lacey Township NJ. Not a great picture but this has to be at least 8” long and there can’t be that many spiders that big in NJ. Not many things make me uncomfortable but this was the biggest spider I’ve ever seen in person and there are routinely black widows in my garage which I pay no attention to. Honestly terrifying. No idea there were any that big in NJ. Wow, that’s weird! I don’t know what it is, I see a spider made out of a cigar with cigarettes for legs and that would make me uncomfortable too. I’m from New Hampshire, and honestly something that looks like a spider made of tobacco products wearing a suit is what New Englanders expect to find in New Jersey 😉 . I live in a toxic waste dump too, the trick is to not dig below 5 inches, that’s where the asbestos waste was used as “free fill” in my yard. Happy Halloween!